See also: Planning for growth-management and zoning maps. This series of maps was produced in February, 2000 by the King County Department of Development and Environmental Services. Each map shows the extent of the given APD, and includes street and municipal features. All PDFs print at 17 x 22 inches (portrait or landscape orientation). This tabloid-size, general reference map shows all of King County's 39 incorporated cities in distinctive, contrasting colors. Interstate and state highways are also featured. The map was created by the King County GIS Center. This countywide map shows ZIP Code boundaries and labels overlaid on a simple base map that includes incorporated areas. King County GIS Center, January 2013. 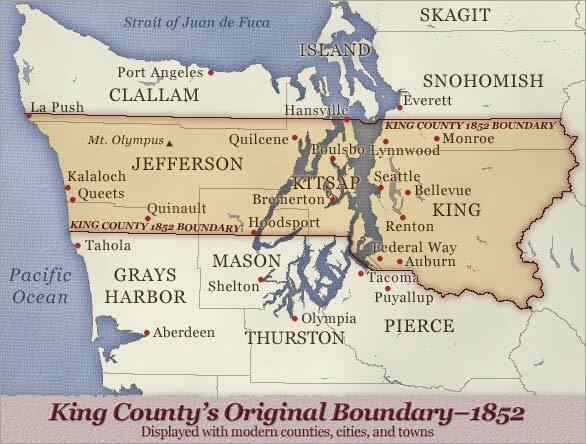 This western King County map is at a larger scale and adds major highways to the basemap. No-shooting areas are delineated portions of King County within which the discharge of firearms is prohibited or regulated by King County Code, Title 12, Chapter 12.68. Each no-shooting area on the map is labeled with its corresponding code section number and area descriptor. A no-shooting area defined by Chapter 12.68 may lie within or extend into an incorporated city, which may have its own laws regulating the discharge of firearms within its boundaries. In addition, although not depicted on the map, King County Code, Title 7, Chapter 7.12.630 regulates the shooting of guns in King County Parks, which is in general prohibited. Map created by the King County GIS Center for the Metropolitan King County Council. Revised September 25, 2006.